Elizabeth & Jameson is a stunning new collaboration comprising two rising stars of the UK acoustic music scene. 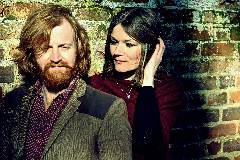 Hannah Elizabeth of traditional folk trio Said The Maiden and Griff Jameson from folk-rock band Fred’s House have joined forces to create an indie-folk sound which encompasses their individual musical backgrounds. Playing all over the UK with Said the Maiden, Hannah’s influences are very much planted within traditional folk roots. This is in stark contrast to Griff’s recent musical history, having penned a string of quirky rock/pop anthems for Fred’s House. Together, Elizabeth & Jameson arguably offers the best of both backgrounds; this is simplistic, classic song writing at its best – a stripped back, harmony-driven sound with guitar, violin and exquisite vocals.